Online comics - the next big thing in visual content marketing? Online comics – the next big thing in visual content marketing? No they’re not. Comics and comic like visual stories (some infographics) are one of the most popular visual content online. But unlike video they are generally cheaper and quicker to produce. And they can potentially solve the problem of where to get engaging content for your website and other online channels for a longer period – not just for a one-off campaign. Yet for marketers, internal communications managers and other professional persuaders video and boring stock photography seem is often the only type of visual content they ever think about. At the same time online comics are a growing market. It might be just a matter of time when digital marketers discover the power of comics. 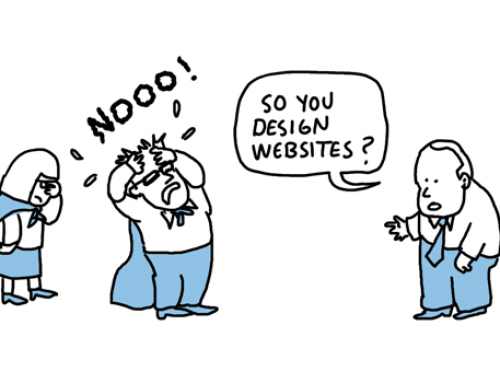 Although I’m a bit surprised it hasn’t happened already – especially after the success of online comics such as Matthew Inman’s The Oatmeal (if you’re not familiar with The Oatmeal check out Inman’s Ignite presentation: The Oatmeal: How to Get 5 Million People to Read Your Website). So what are the killer features comics have compared to other forms of visual communication? Since comics are not yet used extensively in marketing you can use them to surprise your audience. They also have that instant visual gratification that video lacks (you have to wait for the good bits – the still image that YouTube generates is not usually the most intriguing shot from the video). There’s also something strangely effective in the vertical format some online comics take (which makes them resemble infographics). Maybe the scrolling action has similar appeal than clicking the “next” button in Slideshare presentations). You probably know that people’s attention span online is that of a hyperactive squirrel. Comics have an advantage over simple illustrations or data visualisation: they tell a story. And as professional communicators know, there’s nothing more powerful than a compelling story if you want to get your point across. They simply resonate with the way the human brain works. Compared to animation or video comics are usually pretty cost-effective. Yes, a viral video can make your organisation famous overnight. But chances are you’ve ended up paying a lot of money for something that receives a lukewarm response. Unless video is a natural part of your communication or marketing mix then why would you spend thousands of pounds, dollars or euros investing in something that might not even work? And no, I’m not saying that comics will work. But at least failing will be cheaper and you can afford to experiment more. Digital storytelling doesn’t always need to be a multimedia extravaganza. Drawn visuals make abstract topics more concrete and more understandable. So if you’re trying to explain a complex processes or a technical solution to a lay audience a comic might be a good solution. There’s something about drawn imagery that helps make you more approachable. If you use generic stock photos with beautiful smiling people you are also creating anonymous corporate distance between you and your potential client or stakeholder. In some cases this is fine. 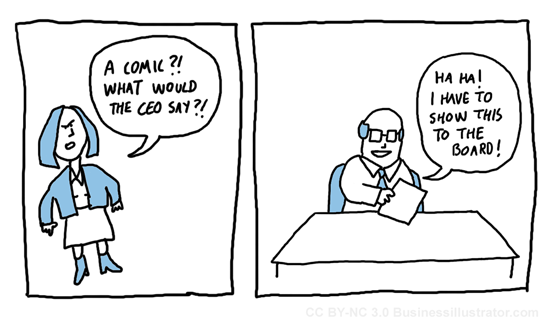 But if your aim is to signal friendliness and make your audience feel that you are not an average corporate player then comics might help you to do this. There’s also something about a drawn, especially hand drawn, line that signals that things are not set in stone and that you are open to change. So if you want to signal agility and responsiveness comics is one way to do this. Expensive looking corporate imagery on the other hand signal stability and sometimes that’s exactly what you want to get across. But it also signals slow-moving and hierarchical. It’s not a coincidence that so many tech startups have gone for the playful, cartoony look instead of “serious” corporate visual brand. For example: if you are an internal comms manager and you want to communicate to staff that you want their opinion on the new initiative. If you use slick graphics or expensive looking video productions at an early stage of a project you are sending a message that things have already been decided. I would love to hear about other examples of comics as a marketing or communications medium (good and bad) as well as your views about the medium in general. This is a great post. I have been toying with the idea of using comic strips to simplify and humanize the complex products and service offerings of a B2B client. Thank you for these examples.